Oculus Rift is a famous virtual reality device. Since 2014, it has been acquired by Facebook, it becomes more popular than before. However, users may find Oculus Rift’s shortcomings. It has no backup app for backing up its games state and other data. Oculus Rift’s apps can only be saved in the installation directory and the installation folder usually is in C drive. Thus, with time goes by, your system partition will be full quickly. If we can install apps in another drive, or move the installation directory to another place, that would be great! Luckily, third-party software vrBackupper can do this. vrBackupper is a free Windows software, which has two features. 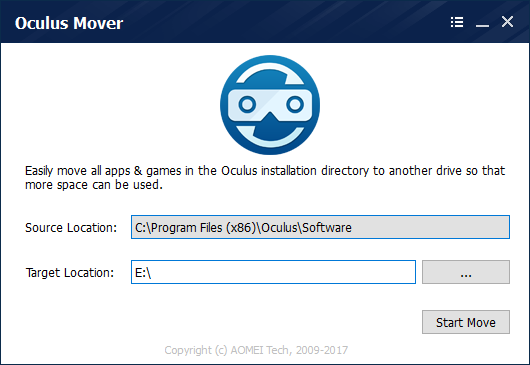 Migrate Oculus installation directory to another location. 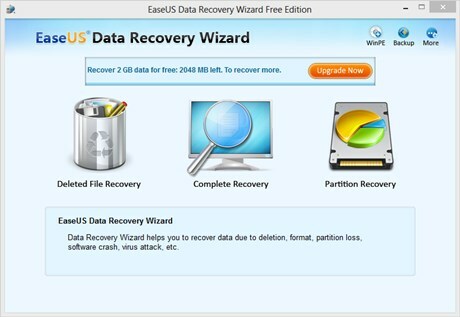 Backup & restore Oculus data. However, vrBackupper supports Windows 10 64 bit only. Don’t worry, vrBackupper is an old product released by AOMEI company last year. In September 2017, AOMEI developed a new product called Oculus Mover 2.0, which supports not only Windows 10, but also Windows 8.1/8 and Windows 7 both 32 and 64 bit. Oculus Mover is a freeware too, it makes sure that Oculus Rift could work normally after migrating. vrBackupper and Oculus Mover are very easy to use, run the program will detect Oculus installation directory automatically. You only need to browser new destination and then start the task. New stored location can be external hard disk too, please notice that don’t change the partition label once connected on your machine. When come to restore, vrBackupper realized universal restore technical. AOMEI has all-in-one backup utility AOMEI Backupper and migrate OS to SSD software AOMEI Partition Assistant, so we trust vrBackupper and Oculus Mover. We suggest you use own them together, their sizes are not big. 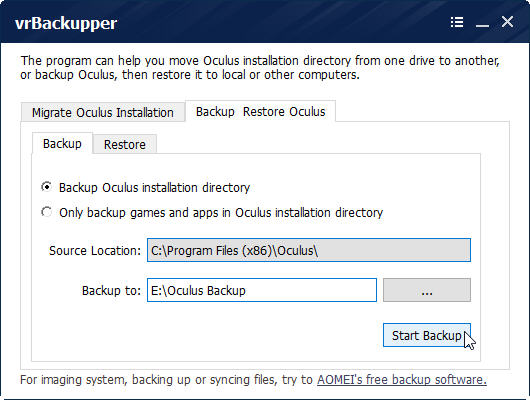 Although Oculus Rift is installed in system partition by default, now you are able to transfer it to another new place with vrBackupper or Oculus Mover. Then help Oculus Rift users solve the headache of low disk space. How useful are they! Related to "Oculus Rift Third-Party Assistants – vrBackupper and Oculus Mover"